Magnolia Mamas : Have a Bear-y Good Day! It's hard to believe we are already two months into our school year. Even harder to believe we are already on our first break of the year! It's amazing how quickly time flies during the school year. The constant "go, go, GO" keeps you on your toes and days, weeks, months become a blur of busy activity. We've managed to keep the chaos to a healthy normal, and even though our schedules seem jam packed, we've enjoyed our transition into the new school year. Before the break we snuck in a few fun activities. It was a short week because of the hurricane, but that wasn't going to stop me from having my turn as mystery reader in Little Cute's classroom. This is one of my favorite parent participation activities we get to do throughout the year. I love seeing how excited my kids are when I walk through that door! It is a memory I hope I never forget! L.C. 's current classroom theme is bears. They've been studying about the letter "B", and even have a prayer bear that they each take turns bringing home throughout the year. Not one to miss a good theme, I jumped on the chance to incorporate bears into my mystery reading duties. I chose a few bear themed books that I knew would be a huge hit, and then I thought of the perfect snack to include with my reading. 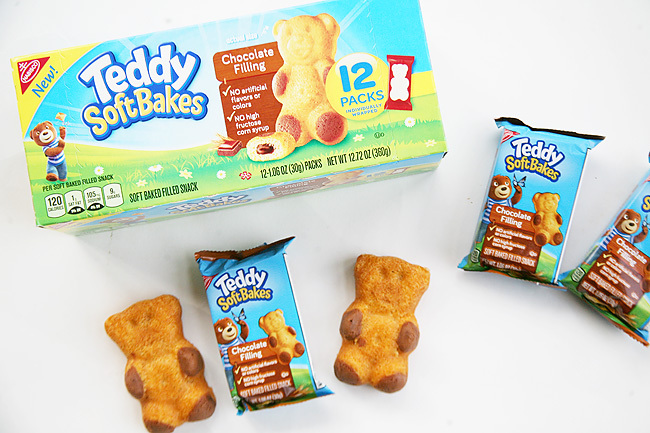 The kids have been loving these TEDDY SOFT BAKED Filled Snacks lately, and I decided they would be perfect to use as my bear themed snack! I mean how much cuter could they be?! The Cutes love them because they are something new and fun shaped (not to mention - chocolate filled! ), and I love them because they don't contain any artificial flavors, colors, or corn syrup. They are actually made with real high quality ingredients such as milk, eggs, and chocolate. 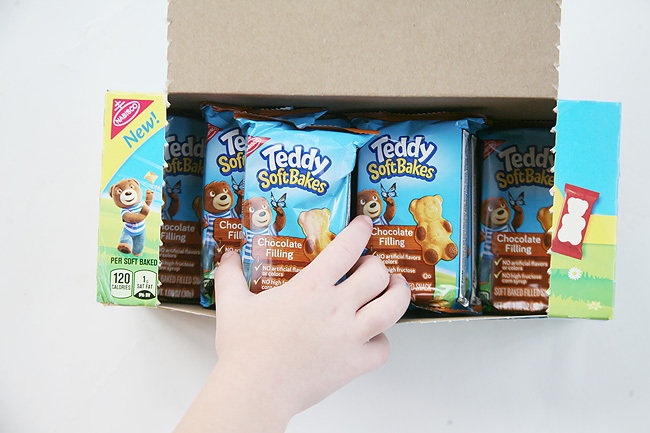 Knowing how important lately it has become for me to understand what we are snacking on, I appreciate that Teddy Soft Baked Filled snacks are something we both agree on. Cute has been begging me to be mystery reader for his class too, and when he heard these bear-y yummy snacks were involved he was so jealous. I've already logged this idea for his classroom when it's my turn in there too. Cute snuck off to Walmart to help me snag enough boxes for both classrooms. 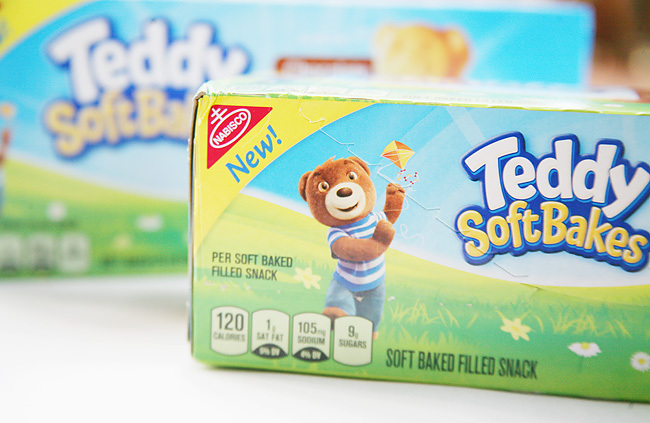 I typically find the TEDDY SOFT BAKED Filled Snacks on Walmart's snack aisle, organized with the other individual wrapped snack packs. They come in two different flavors - chocolate and vanilla - but Cute informed me chocolate was the best. 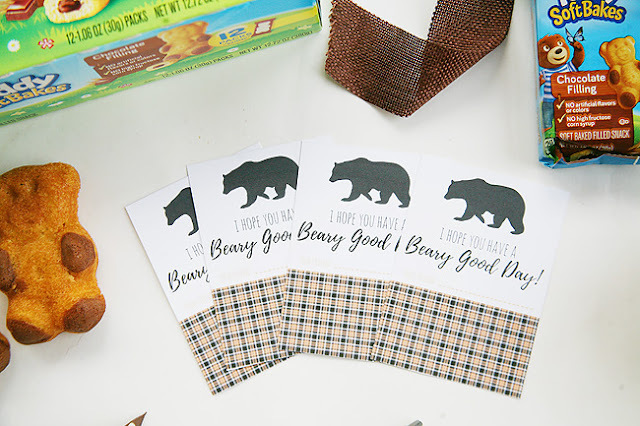 After bringing home our purchases, I set to work to create a fun printable to coordinate with our bear theme. 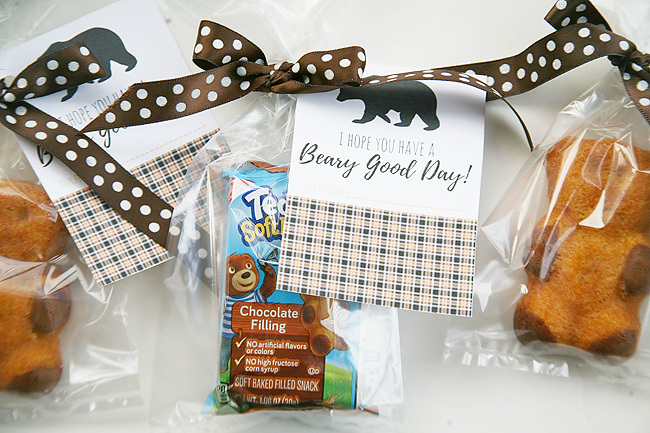 I think it turned out so fun, and loved how the adorable bear themed snack help tie everything together. My bear theme was complete, and the kids were so excited to get a little something extra fun with the reading. They could eat right away their treat right away or save for when they had snack time at home. 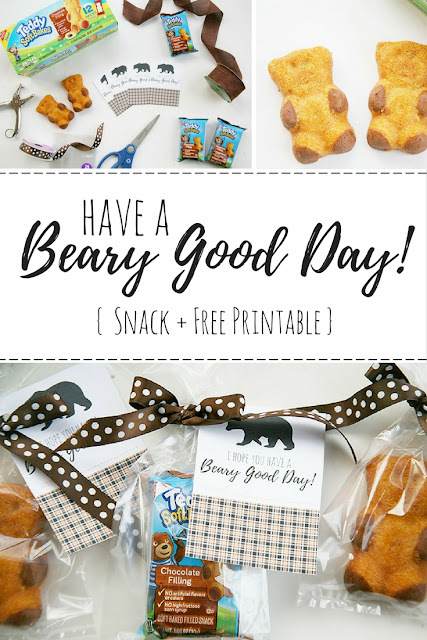 It was easy, mess free, and the perfect addition to our bear themed fun! I love great on the go snacks that make little projects like this so easy for me! 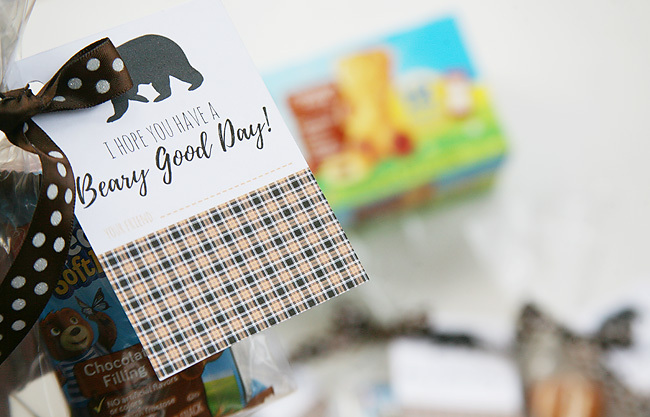 Download the "Beary Good Day" favor tags. 1: Print and cut out favor tags. Set aside. 3: Secure with coordinating ribbon, and attach favor tag. 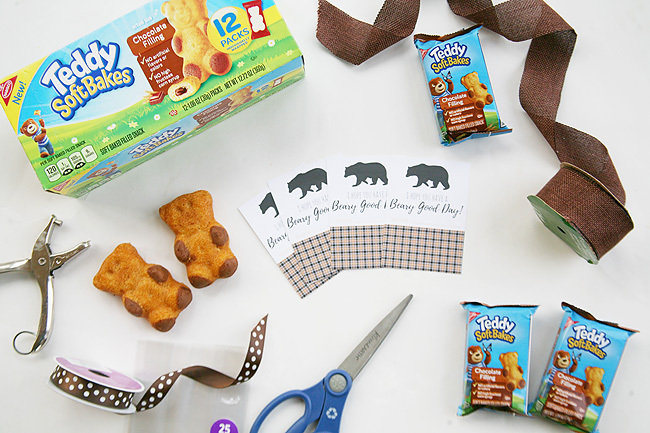 4: Share and enjoy giving everyone a "Beary Good" snack! 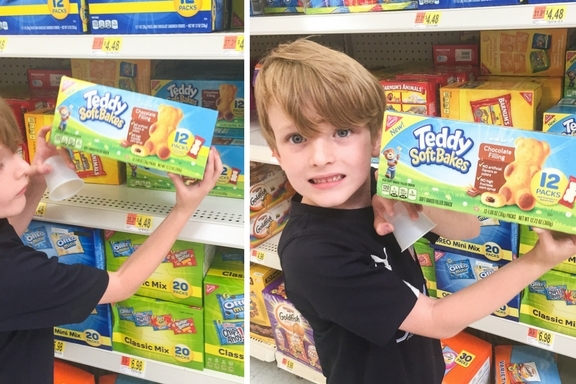 We are so excited about TEDDY SOFT BAKED Filled Snacks that we are helping to giveaway the chance for 12 lucky readers to win a $50 gift card to Walmart to join in our snack time fun! In addition, two lucky grand prize winners will be given the chance to win a $200 Walmart gift card! The giveaway will run through September 29, 2017. I-C will randomly select 14 winners from all program entries and will facilitate fulfillment of the winning prizes. Enter below and good luck! 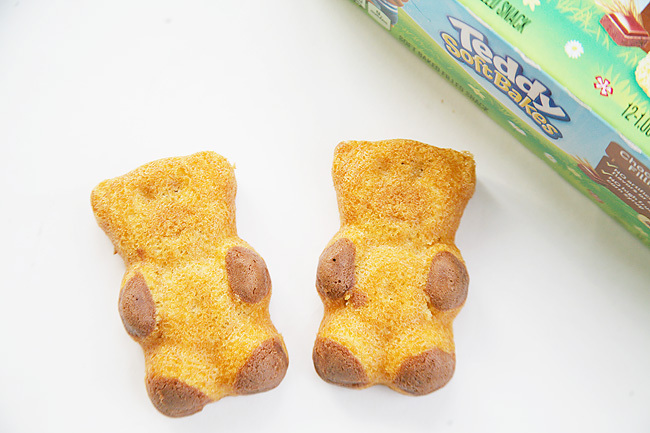 What "Beary Good" snacks do your kids love to share at school?